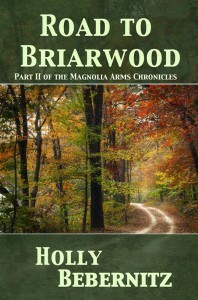 The second installment in the Magnolia Arms Chronicles series by independent author and publisher Holly Bebernitz, Road to Briarwood continues the story begun in Trevorode the Defender as Agnes finds love–and continues trying to find herself. Like most people who lead two lives, Agnes Quinn prefers one over the other. Though teaching English at Brighton Park Community College provides her a reliable income, she longs to remain at the Magnolia Arms and complete her book on the Bridger family history. Only her dream of preparing for her future role as Mrs. Sefton Wilkinshaw compels her to return to work. Before she can board the train, however, her resolve is unsettled by a distressing encounter with a sinister stranger—the first in a long procession of prickly administrators, capricious colleagues, and eccentric friends awaiting her return home.